A DRESS WITH OPTIONS! From the Candle on the HillTM pattern line comes this comfortable, practical, and modest dress! Dress has back zipper closure, simple bust darts for a gentle fit, and includes all the following options to give you a variety of dresses from just one pattern! 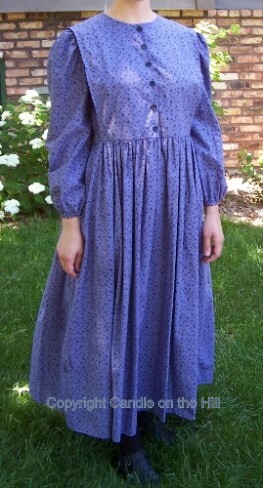 The Simply Modest Dress with cape is a standard dress worn by conservative Mennonite, Brethren, and Amish-Mennonite groups. Many other ladies also find this pattern to be a favorite due to the modest, simple, and classic design. This dress pattern includes ladies sizes Small-XXLarge.